The following information is provided by the Ohio EPA and was taken from their “A Community Awareness Announcement for The City of Columbiana” brochure. For an original copy of the brochure, please contact the utilities office. Where does Columbiana’s drinking water come from? Columbiana’s drinking water is pumped out of the ground from nine wells located in six different well fields on the south end of town in Fairfield Township. This ground water is pumped to the water treatment plant where it is softened, filtered and chlorinated. From there, it is pumped through an underground network of pipes to Columbiana’s homes and businesses. All ground water originally comes from rain or melted snow that has seeped into the ground. Water fills spaces between sand and gravel, as well as fractures of rocks. Where underground water is abundant enough to provide adequate source of drinking water, the water-rich sediments or rocks are called an aquifer. Ground water does not stay in one place. The ground water supplying Columbiana’s wells seeps very slowly from south to north. This means that if pollutants are spilled on the ground anywhere near the wells, or south of the wells, they may eventually enter the ground water that you are drinking. And although the water treatment plant removes bacteria, it would be very expensive to purchase treatment systems for every type of pollutant. This is why everyone in the City of Columbiana should know about Drinking Water Source Protection. Drinking Water Source Protection is a plan of action for protecting the water you drink from contamination at the source. To assist the City of Columbiana with our drinking water source protection efforts, Ohio EPA provided the City with a Drinking Water Source Assessment Report. 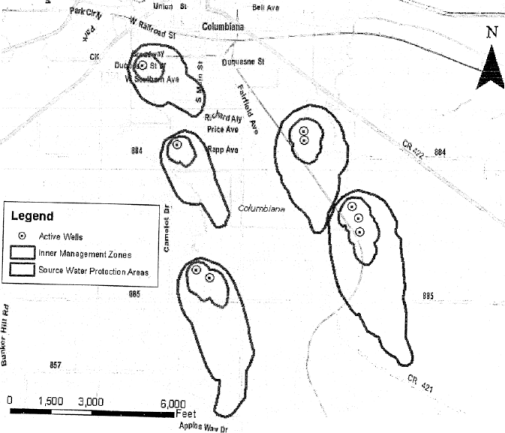 The report includes a map of the protection area (see below), based on calculations of how far water travels through the aquifer in five years. The report also includes information on land use and facilities that may pose a contamination risk to the drinking water source. Potential risks are based on proximity to the drinking water source and the kinds/quantities of chemicals that are typically handled by these types of facilities. 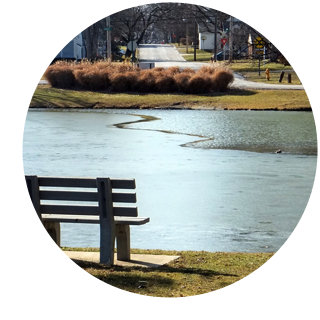 If you would like to be more involved with the City’s drinking water protection efforts or if you would like to see a copy of the City’s drinking water source protection plan, please contact the City of Columbiana’s Manger’s Office at (330) 482-2173 or visit www.cityofcolumbiana.org. Most importantly, if you live or work within the City of Columbiana’s drinking water protection area please pay attention to the “Did you Know…” portion of this webpage. Only 3% of the water on earth is drinkable. Less than one gallon of gasoline can pollute one million gallons of water. You can avoid contaminating your source of drinking water by properly disposing of chemicals that have the potential to cause ground water contamination. Pouring wastes down a storm drain because many storm drains lead directly into the ground or a nearby stream.